Wanna be intelligent and witty? Wanna impress everyone with your amazing knowledge? You can do all this with a subscription to the awesome Wacky ... but true online magazine. 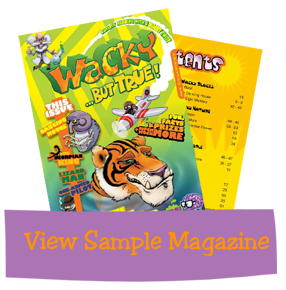 Each month you will receive 68 pages of exciting interactive fun. Do the online quiz, access safe websites and enjoy the fun animation surprises waiting for you as you click through the pages of this cool magazine. online edition of Wacky Mag!